Football Champions Cup slot machine from NetEnt is a football themed title, which was inspired by the Euro 2016 championships, timed for release, as it was, just before the tournament started. The game has 5 reels, 20 paylines, and a max jackpot of 2,000x. There are two bonus rounds, the Penalty Shootout bonus, and also a free spins bonus with up to 25 free spins and a huge 16x multiplier. For all the details, check out the Football Champions Cup slot review below. For all the excitement of a major football tournament without the crushing disappointment of seeing your side eliminated in the first knock-out round, the Football Champions Cup slot may be the dream ticket. Perfect for all you patriots out there, this five-reel, 20-payline title from NetEnt slots lets you select from 24 nations before a ball is even kicked as you run out to the exciting atmosphere of a major football tournament complete with crowd sound effects and a selection of unique soccer-themed symbols. 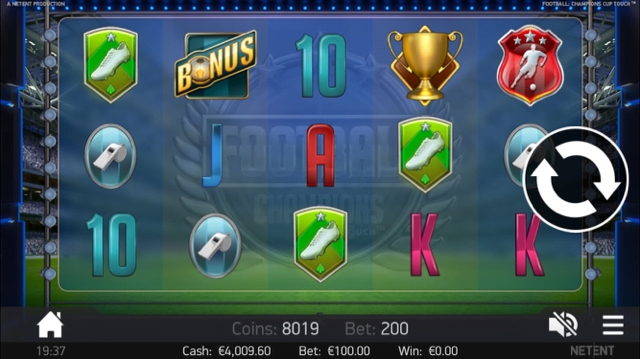 The Football Champions Cup slot machine boasts a regular base game jackpot of 2,000x your line bet and two exciting bonus feature, the game can be played from as little as £0.20 per spin on all desktop, mobile and tablet devices, making the perfect way to enjoy all the big match atmosphere on the go. Also featuring randomly-triggered overlay wilds, the game frequently pays out wins that are easily comparable to a superstar’s salary. While soccer-themed slots tend to be short on bonus rounds, the game bucks this trend courtesy of two unique features. First up, there’s the Penalty Shootout bonus that is triggered by landing three or more bonus symbols anywhere on the reels. When this occurs, mobile casino players will get to take and save a series of penalties, with cash prizes awarded for the former and multipliers dished out for the latter. Next up, there’s a free spins feature that actually places players in the thick of the tournament action. Activated whenever trophy symbols appear on reels two, three and four simultaneously, players will initially benefit from five free spins. Any red wilds that appear during these bonus games will result in a goal in their favour, while any blue wilds will gift a goal to the opposing national team. Should players emerge victorious after the five free spins, they’ll progress to the next round of the competition, meaning 25 bonus games can be played in total. What’s more, if they finish in any of the three medal positions, they’ll also receive a progressively more rewarding cash prize as well. A breath of fresh air in the tired soccer slot genre, the Football Champions Cup slot combines a generous paytable with two exciting bonus features to create an unforgettable matchday experience. Like the Football Champions Cup slot review? Check out these as well…..